Necromancy (Greek: νεκρομαντία, nekromantía) is a form of divination in which the practitioner seeks to summon "operative spirits" of the dead for multiple purposes, from spiritual protection to the acquisition of wisdom. The word necromancy derives from the Greek νεκρός (nekrós), "dead," and μαντεία (manteía), "divination." However, since the Middle Ages, necromancy has come to be associated more broadly with black magic and demon-summoning, losing its earlier less-pejorative meaning. It is important to note that necromancy is separated by a thin line from demonology and conjuration. Necromancy is communing with the spirits of the dead, rather than the evil spirits of conjuration and demonology. The act of necromancy was widespread in the ancient world and the practice has existed from prehistoric times. Early necromancy likely originated as an outgrowth of shamanism, which propitiated the spirits/ghosts of ancestors. Classical necromancers addressed the dead in "a mixture of high-pitch squeaking and low droning," comparable to the trance-state mutterings of shamans. The historian Strabo refers to necromancy as the principal form of divination amongst the people of Persia (Strabo, xvi. 2, 39), and it is believed to also have been widespread amongst the peoples of Chaldea (particularly amongst the Sabians or star-worshipers), Etruria, and Babylonia. The Babylonian necromancers were called Manzazuu or Sha'etemmu, and the spirits they raised were called Etemmu. For the ancient Greeks, necromancy was also a popular practice. In the Odyssey (XI, Nekyia), Odysseus makes a voyage to Hades, the Underworld, and raises the spirits of the dead using spells which he had learnt from Circe (Ruickbie 2004, 24). His intention is to invoke and ask questions of the shade of Tiresias, but he is unable to summon it without the assistance of others. Although some cultures may have considered the knowledge of the dead to be unlimited, to the ancient Greeks and Romans, there was an indication that individual shades knew only certain things. The apparent value of their counsel may have been a result of things they had known in life, or of knowledge they acquired after death: Ovid writes of a marketplace in the underworld, where the dead could exchange news and gossip (Metamorphoses 4.444; Tristia 4.10.87–88). There are also many references to necromancers, called "bone-conjurers," in the Bible. The Book of Deuteronomy (XVIII 9–12) explicitly warns the Israelites against the Canaanite practice of divination from the dead. This warning was not always heeded: King Saul has the Witch of Endor invoke the shade of Samuel using a magical amulet, for example. Later Christian writers rejected the idea that humans could bring back the spirits of the dead, and interpreted such shades as disguised demons, thus conflating necromancy with demon-summoning. This conflation seems to be a flagrant misread of the biblical texts. In the Hebraic mindset, the dead could be called to speak to the living. Norse mythology also contains examples of necromancy (Ruickbie 2004, 48), such as the scene in the Völuspá in which Odin summons a seeress from the dead to tell him of the future. In Grógaldr, the first part of Svipdagsmál, the hero Svipdag summons his dead mother, Gróa, to cast spells for him. In Hrólf Kraki's saga, the half-elven princess Skuld was very skilled in witchcraft, to the point that she was almost invincible in battle. When her warriors fell, she made them rise again to continue fighting. In the middle ages, the literate members of European society were either the nobles or Christian clergy. Either of these groups may have been responsible for the propagation and ongoing practice of necromancy, even though it was forbidden in Christianity. It is apparent that necromancy was not a method of witchcraft. It may have been only available to the scholarly class of Europe, because of the accessibility, language, knowledge and methods that it employs. There are a few confessions of some nobles or clergy members professing a history of experience with necromancy, although these may well have been obtained under duress (for example, the Salem Witch Trials). Some suggest that necromancy could have become a way for idle literate Europeans to integrate Hebrew and Arabic legend and language into forbidden manuals of sorcery. The possibility exists that literate Europeans were the main forces simultaneously practicing and condemning necromancy. The language, execution and format of the rituals illustrated in the Munich Handbook (Kieckhefer 42–51) are strikingly similar to Christian rites. In a Christian exorcism, various demons and spirits are driven away by name, in the name of God, Jesus or the Holy Spirit. The spells of necromancy are very similar to these Christian rites (Kieckhefer 128–129) in their complete opposition. The distortion of the rites into spells is within the scope of Christian understanding at that time. Necromantic spells were mainly illusory or utility spells. Modern scholarship suggests that most were written with hopes that their utility would prove to be useful in acquiring a feast, horse, cloak of invisibility or perhaps just notoriety among others in the necromancy practicing clergy. The nature of these spells lent themselves to being understood as underground clergy members deviantly indulging in unlawful pleasures. The rare confessions of those accused of necromancy suggest that there was a range of spell casting and related magical experimentation. It is difficult to determine if these details were due to their practices, as opposed to the whims of their interrogators. John of Salisbury was one of the first examples related by Kieckhefer, but as a Parisian ecclesiastical court record of 1323 shows, a “group who were plotting to invoke the demon Berich from inside a circle made from strips of cat skin,” were obviously participating in the church’s definition of “necromancy” (Kieckhefer, 191). The probable reason that these renegade so-called necromancers were dabbling in the dark arts is that the evolution of "natural" magic and "spiritual" magic was slow. Caesarius of Arles (Kors and Peters, 48) entreats his audience to put no stock in any demons, or “Gods” other than the one true Christian God, even if the working of spells appears to provide benefit. He states that demons only act with divine permission, and are permitted by God to test Christian people. 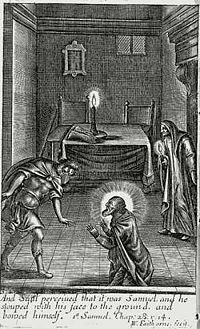 Caesarius does not condemn man here; he only states that the art of necromancy exists, although it is prohibited by the Bible. Within the Richard Rawlinson necromantic manuscript, a fable is presented as a warning to those that would perform necromancy, although the story ends with a note of physical trial, but without mention of the ramifications in the afterlife. In the wake of these inconsistencies of judgment, necromancers, sorcerers and witches were able to utilize spells with holy names with impunity, as biblical references in such rituals could be construed as prayers as opposed to spells. As a result, the necromancy discussed in the Munich Manual is an evolution of these understandings. It has even been suggested that the authors of the Munich Manual knowingly designed this book to be in discord with understood ecclesiastical law. It is possible to trace Christian ritual and prayer and its subsequent mutant forms of utility and healing prayer/spells to full-blown necromancy. The main recipe employed throughout the manual in the necromancy sorcery uses the same vocabulary and structure utilizing the same languages, sections, names of power alongside demonic names. The understanding of the names of God from apocryphal texts and the Hebrew Torah demand that the author of such rites have at least a casual familiarity of these texts. The structure of the spells themselves also requires that the author have experience with Christian rites that are not pedestrian, again suggesting either the Nobility or Christian scholars as possible suspects. As we have suggested that alleged Christians might have been the authors of the sundry necromancy manuals, the question of their inspirations must arise. One of the first clues could be the Gods and demons references in the illusions, conjurations and spells. The Hebrew Tetragrammaton and various Hebrew derivatives are found, as well as Hebrew and Greek liturgical formulas (Kieckhefer, 139). Within the tales related in these Manuals, we also find connections with other stories in similar cultural literature (Kieckhefer, 43). The ceremony for conjuring a horse closely relates to the Arabic The Thousand and One Nights, and the French romances. Geoffrey Chaucer’s The Squire's Tale also has marked similarities. This becomes a parallel evolution of spells to foreign gods or demons that were once acceptable, and framing them into a new Christian context, albeit demonic and forbidden. Most forms of Satanic Necromancy today include prayers to such Demons, namely Nebiros, Azrael, and Beelzebub. As the source material for these manuals is apparently derived from scholarly magical and religious texts from a variety of sources in many languages, it is easy to conclude that the scholars that studied these texts manufactured their own aggregate sourcebook and manual with which to work spells or magic. The seventeenth-century Rosicrucian Robert Fludd describes Goetic necromancy as consisting of "diabolical commerce with unclean spirits, in rites of criminal curiosity, in illicit songs and invocations and in the evocation of the souls of the dead." Modern séances, channeling and spiritualism verge on necromancy when the invoked spirits are asked to reveal future events. Necromancy may also be dressed up as sciomancy, a branch of theurgic magic. Necromancy is extensively practiced in Quimbanda and is sometimes seen in other African traditions such as voodoo and in santeria, though once a person is possessed by a spirit in the yoruba tradition he cannot rise to a higher spiritual position such as that of a babalawo. Necromancers in fiction are often depicted as a type of wizard that summons demons and corpses keeping them fully under his control until they are no longer needed and are reduced (or die again) to ashes. In several fictional books, such as Eragon, necromancers have sold their souls to demons or to the devil in order for them to receive their undead powers. Sauron was known as "The Necromancer" to the White Council in J. R. R. Tolkien's The Hobbit (until Gandalf discovered his true identity) presumably because he was a controller of undead beings (Barrow-Wights and Ringwraiths). ↑ 1.0 1.1 Georg Luck, Arcana Mundi: Magic and the Occult in the Greek and Roman Worlds (Baltimore, MD: The Johns Hopkins University Press, 2006). Luck, Georg. Arcana Mundi: Magic and the Occult in the Greek and Roman Worlds. Baltimore: The Johns Hopkins University Press, 2006. ISBN 0-8018-8346-6. Ruickbie, Leo, Witchcraft Out of the Shadows. Robert Hale, 2004. ISBN 0-7090-7567-7. Spence, Lewis. An Encyclopedia of Occultism. Hyde Park, NY : University Books. 1920. This page was last modified on 14 November 2018, at 16:21.